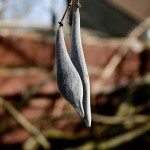 What fertilizer do I use for Wisteria? Now right? These vines generally do not need fertilizer, as they will grow excessively and too much can also inhibit flowering. 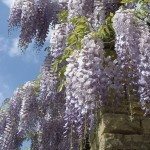 If you do feed wisteria, then I would recommend using a balanced fertilizer - unless there is an issue with flowering, which would require additional phosphorus, like bone meal. Also, fall fertilizing is the best time, should you do so, as feeding the plant in spring can encourage leaf growth and discourage blooms.